Hi, guys! 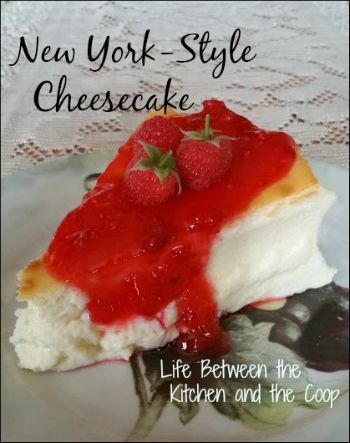 Today I’m going to share my New York-Style Cheesecake recipe that I want to share with you today! I got this delicious cheesecake recipe years ago from my college roommate, Becky. This cheesecake is delicious…and pretty impressive looking if you put a nice fruit drizzle on a slice to serve it to company. Most of the time when I make this I do a strawberry drizzle…I’ll explain how to make that at the end of the post. However, this time I used some raspberry jam that I had just made from the raspberries in our garden. It was so amazing! If you want to make strawberry drizzle to top your New York-style cheesecake, just slice up some strawberries, add a tsp or two of water, then add sugar to taste. 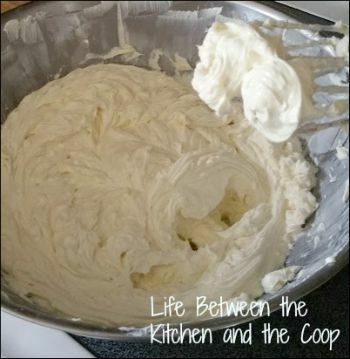 Blend the softened cream cheese, butter, and the sour cream in a large bowl. 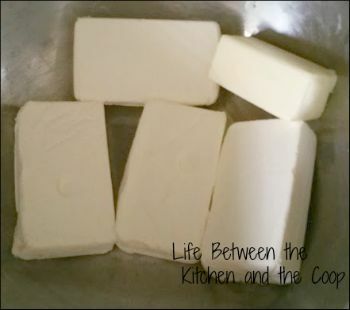 Once smooth, add cornstarch, sugar, vanilla, and lemon juice. Beat in one egg at a time until well-mixed. Pour into a greased 10 inch springform pan. Place that springform pan into a roasting pan filled with enough hot water to come halfway up the side of the springform pan. Preheat the oven to 375 degrees. Bake for one hour or until top is brown (I usually start checking it every five minutes after 40 minutes as oven cooking times may vary). While it is baking, you can make the strawberry drizzle if you like. It’s super easy. If you want to make strawberry drizzle to top your New York-style cheesecake, all that you have to do is just slice up some strawberries, add a tsp or two of water, then add sugar to taste. Once the top is browned a bit, turn the oven off. Open the oven door and let the cake cool in the oven for one hour. Then remove it from the oven and let it stand for two hours. Refrigerate for at least 6 hours before serving. When ready to serve, cut into 16 slices using dental floss. Wipe the floss after each cut. Top with whatever topping you like. My favorites are strawberry or red raspberry…so good! ***Once little note…You will be tempted to cheat and just take it out of the oven, pop it out of the springform pan and then eat it. DON’T! I did that once. It was literally a hot mess. Cheesecake completely fell apart. Take the time and do it right…I promise it will be worth it! Don’t forget to follow us on Bloglovin’ ! P.S. 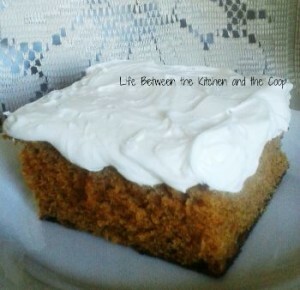 If you like this recipe, I think you’ll love Yummy Pumpkin Cake! Previous story We Have a Winner in our Monthly Starbucks Gift Card Giveaway!